Only five days to go on my Gratefulness Challenge! Luckily my worry of running out of things to be grateful for by day 25 didn’t come true. Instead I find myself frequently getting stuck on what to choose. I’m trying to cram all the most important ones in there before the month is up, but I doubt I will get them all in. I guess that just leaves room for another list later down the road. 1. Improvisation: I know that I may sound like I have it all together, but in all honesty, a lot of the time I have no clue what I am doing. I make it up as I go along. Some of the best things come out of just throwing all the balls up in the air and seeing where they fall. I’m referring to the kind of improvisations that we do every day often without even thinking about it. It’s those moments where you read the situation and realize that what you had planned on doing just isn’t right or that something else would be even better. Improvisation is all about being open, receptive and flexible. You can spend you’re entire life planning, but that won’t get you very far if you aren’t wiling to make spontaneous changes when necessary. I catch myself in moments of improvisation all the time. I find that sometimes what is created through improvisation is better than anything I could have ever planned. Sometimes in the doing we are able to discover solutions which would have been almost impossible to find through intellectual thought. 2. Varying perspectives: We all have our own set of experiences which shape who we are and what we believe. I have always been intrigued by what exactly causes us to become the person we are. What events and situations cause us to develop certain opinions and adopt certain habits. This fascination is why I love hearing other people’s perspectives. I also think that hearing other’s opinions is really helpful in our growth as individuals. Seeing another side of a situation always helps me redefine what I believe in and solidify my values. It also can be really beneficial to hear other perspectives because sometimes other’s top priorities are things you wouldn’t have even thought of. Currently I am in the development stages of a new creative partnership and have been meeting quite frequently with the other people involved to hash out the details of the project. We have spent a lot of time hearing everyone’s opinions and using these ideas to further solidify exactly what we are trying to accomplish. It is so interesting to hear the things that one person is really passionate about and another has no concern over as well as to witness the negotiation of these perspectives. People are such fascinating creatures. I am constantly amazed at our ability to work together despite how different our views on life may be. It gives me hope for the future when I see perspectives bringing people together instead of tearing them apart. 3. Memories: I think memories are one of the biggest joys in my life. Though I do always try to live in the present, I think that reflection on my past really helps keep me grounded and urges me to continue growing. It is my past experiences that inform the choices I currently make. Life is really just a series of opportunities for making memories. I personally believe that we remember everything we have ever experienced on some level within our being. It is this history which guides us throughout life. We may not consciously remember everything that has happened to us but our past still informs our choices. 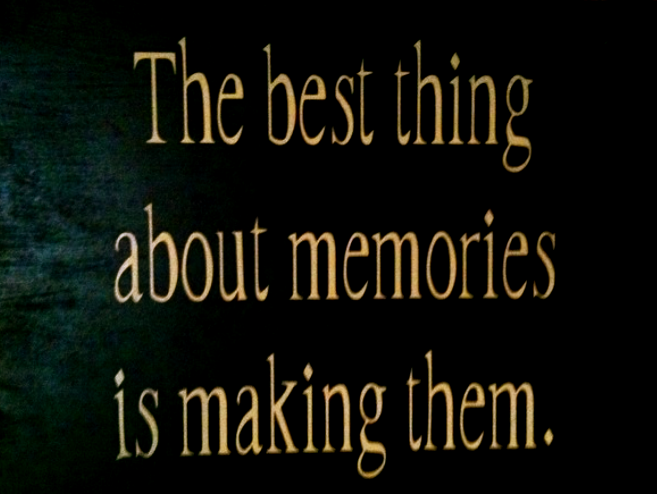 Memories also help us bond with the people around us. These shared experiences form the foundation for lasting relationships. They create connection and also help us remain determined to continuing fostering those relationships in future. If we remember successfully sharing memorable moments with someone, we feel motivated to create similar memories with them. We trust that they are a positive individual to have in our lives. Though not all memories may be good, I think they all serve some sort of purpose. All we can do is try and learn from our past through remembering but also moving on. I cherish both the good and bad memories in my life because I know that they have all contributed into making me the person I am today. I look back on the not so great moments and realize now that they really did serve a purpose in my journey. I think back on all the great moments in my life and smile. They remind me of how truly blessed my life has been.